Deric's MindBlog: Stress pathways that impair prefrontal cortex. The prefrontal cortex (PFC) — the most evolved brain region — subserves our highest-order cognitive abilities. However, it is also the brain region that is most sensitive to the detrimental effects of stress exposure. Even quite mild acute uncontrollable stress can cause a rapid and dramatic loss of prefrontal cognitive abilities, and more prolonged stress exposure causes architectural changes in prefrontal dendrites. Recent research has begun to reveal the intracellular signalling pathways that mediate the effects of stress on the PFC. This research has provided clues as to why genetic or environmental insults that disinhibit stress signalling pathways can lead to symptoms of profound prefrontal cortical dysfunction in mental illness. The prefrontal cortex (PFC) has extensive connections with other cortical and subcortical regions that are organized in a topographical manner, such that regions that regulate emotion are situated ventrally and medially (green area in part a of the figure) and regions that regulate thought and action are situated more dorsally and laterally (blue and blue–green areas in part a). The dorsolateral PFC (DLPFC) has extensive connections with sensory and motor cortices and is key for regulating attention, thought and action1. In humans, the right inferior PFC (rIPFC) seems to be specialized for inhibiting inappropriate motor responses. By contrast, the ventromedial PFC (VMPFC) has extensive connections with subcortical structures (such as the amygdala, the nucleus accumbens and the hypothalamus) that generate emotional responses and habits and is thus able to regulate emotional responses. Finally, the dorsomedial PFC (DMPFC) has been associated with error monitoring9 and, in human functional MRI studies, reality testing. These PFC regions extensively interconnect to regulate higher-order decision making and to plan and organize for the future. Under non-stress conditions (see part a of the figure), the extensive connections of the PFC orchestrate the brain's activity for intelligent regulation of behaviour, thought and emotion. The PFCalso has direct and indirect connections to monoamine cell bodies in the brainstem, such as the locus coeruleus (LC) (where noradrenaline projections arise) and the substantia nigra (SN) and ventral tegmental area (VTA) (where the major dopamine projections originate), and thus can regulate its own catecholamine inputs. Optimal levels of catecholamine release in turn enhance PFC regulation, thus creating a 'delicious cycle'. 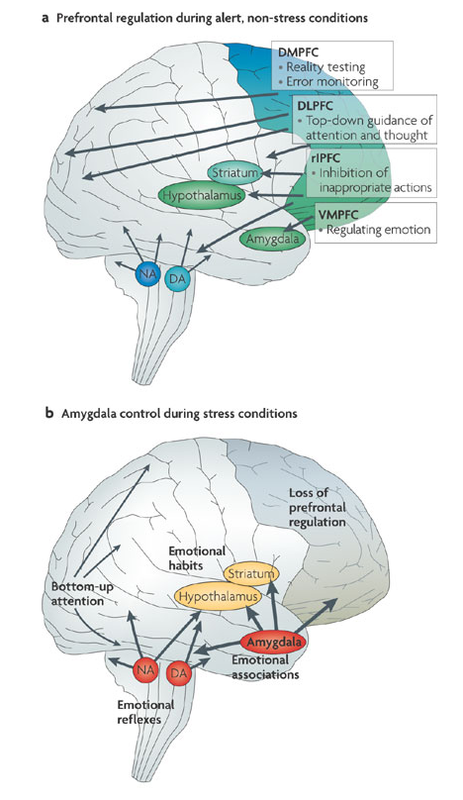 Under conditions of psychological stress (see part b of the figure) the amygdala activates stress pathways in the hypothalamus and brainstem, which evokes high levels of noradrenaline (NA) and dopamine (DA) release. This impairs PFC regulation but strengthens amygdala function, thus setting up a 'vicious cycle'. For example, high levels of catecholamines, such as occur during stress, strengthen fear conditioning mediated by the amygdala. By contrast, stress impairs higher-order PFC abilities such as working memory and attention regulation. Thus, attention regulation switches from thoughtful 'top-down' control by the PFC that is based on what is most relevant to the task at hand to 'bottom-up' control by the sensory cortices, whereby the salience of the stimulus (for example, whether it is brightly coloured, loud or moving) captures our attention5. The amygdala also biases us towards habitual motor responding rather than flexible, spatial navigation. Thus, during stress, orchestration of the brain's response patterns switches from slow, thoughtful PFC regulation to the reflexive and rapid emotional responses of the amygdala and related subcortical structures. It makes more sense if depression causes this effect. Depression is an adaptation to desperate and hopeless situations (i.e. to situations and environments where continued effort to pursue a certain goal will result in either danger or loss of valuable resources.) A mechanism which degenerates the PFC will help to give up unrealistic dreams and unachievable goals. Stress is a state of increased alertness of the body, a physiological response to events that could threaten the organism, and it represents a good trade-off for the self-optimization of contradicting properties (maximal attention and minimal resource usage). This make sense to me as it is, but Ï would not be able to see what is the role that depression has here, because I belive stress is the main cause that produces it. Maybe depression is caused by the repetitive stress expousure. Although this last sentence contradicts the theory that says that depression is an evolutionary adaptation to execively high expectations.